Tachair Bookshoppe presented a hyper-local piece of history that had national relevance Saturday night. Jersey City’s newly opened bookstore hosted David Goodwin, a Jersey City resident and urban historian who has completed his master thesis – Enter the Artists: The Early Years of 111 First Street. The event was an appropriate complement the current exhibit at Tachair – A Fragile Utopia, Photographs of Edward Fausty Depicting 111 First Street. 111 First Street is the now torn down but far from forgotten former factory that became home to hundreds of artists during the Clinton era and is seen as a the most visible example of this watershed period that turned Jersey City from a depressed post-industrial town into an urban enclave for Gen-Y. Goodwin’s Enter the Artists: The Early Years of 111 First Street is available online here. The reading/talk was a sequel to one he gave a week earlier at the Jersey City Public Library as part of the Jersey City Artist Studio Tour. The thesis studies the historical process of gentrification in urban neighborhoods and the harbinger role artist play in that process. 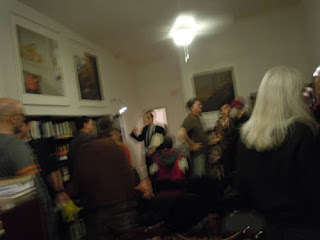 At the library talk Goodwin read the chapter on the rise of 111 First Street, Tachair Bookshoppe featured the final chapter – the decline and fall and utter demise of this exemplary artist work and living space. Jersey City just finished its Annual Artist Studio Tour. The Kick Off Party was declared – best ever! (isn’t it always thus?) – as readers of Dislocations know, local artists and their art make up lots of blogs. 111 First Street has become the stuff of legend – a cigarette factory after years of being fallow and cities being abandon by white flight and the decimation of industrial America, in the late 80s artists needing affordable studio space, became our pioneering forefathers of the local arts, back in the days when the Newport Mall was new, there was a Woolworth’s on Newark Avenue and a PATH train ride cost 75 cents. Artists being artists, they used the studio spaces as living spaces, which was against city ordinances. The building owner and municipal authorizes ignored the violation and encouraged an artist community that soon flourished in the building, which saved the entire district from completely succumbing to urban decay. Upwards of 200 artists lived in this one-block edifice. But as the late 90s “Gold Coast” building boom of Jersey City rippled through the waterfront and powerhouse district, the building’s new owner, a Manhattan based real estate mogul, decided to kick the artists out for what our municipal government agreed was the greater good: a higher return on investment. 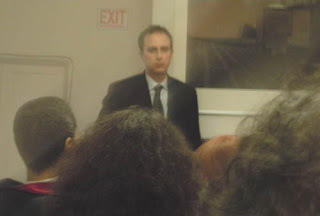 At Tachair, Goodwin gave an overview of the final clash between the artists and their landlord – guess who lost – EVERYBODY – the artists won their legal fees, were given two months to vacate the premises and 111 First Street was demolished, the developers submitted plans to build a 52-story luxury housing complex, mixed use property. Mixed use means a mix of upper class retail establishments. Affordable housing is part of the deal, but our city government keeps approving each new minimum of affordable units the developer requests. Soon after the demolition, the economy went into the crapper and construction was postponed. 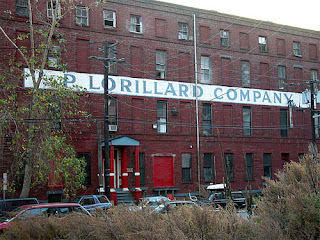 The lot where this building has been fallow for more than half a decade. 111 First Street haunts Jersey City. Municipal authorities go out of their way to declare the government to be arts friendly. Examples of increased cooperation and support abound – as the kick off party at Tenmarc indicated. Funding is tight nationwide, so everyone understands that there’s more bluster than bucks coming from city hall. But developers ultimately pull the strings and artists agree that officials are not dependable allies. Developers have deep pockets. When push comes to shove, artists are expandable and politicians always seem to follow the money when they define what is in the public interest. But it’s not just artists who are haunted by the dim outcome of 111 First Street, but the politicians and city officials. They understand that artists provide long-term quality of life returns and see the gaping hole at 111 First Street and at least on the surface, seem more willing to accommodate – and encourage developers to accommodate – artists and the arts than they may have been in the past. Artists are gentrification instigators and at the end of the process are priced out of the land they settled. At some level, authorities here are cognizant that maybe a change of pattern is needed and artists must remain so long-fallow lots like 111 First Street can be avoided. Goodwin pointed out that the 111 First Street story was an aberration of what had been the process of gentrification. After the artists move into an area – economic activity arises –bodegas, supermarkets, coffee shops – retailers and services and other residents follow, by professionals like teachers (or trade magazine writers) – solidly middle class or lower middle class professionals. The upper classes and trust funders may eventually rule the roost, but the process is gradual and along the way, taxes are collected, libraries and schools are opened or improved, infrastructure refurbished. The artist is at the forefront of a tide that lives the collective quality of life boat. Now, it’s no so clear cut – rent control laws are some protection against population displacement, so middle and lower classes can still call places like Soho or the West Village (or downtown J.C.) home. Studio space – artist workspaces – carry no such tenant protection. When the lease is up, developers decide their fate. It is important to remember that this pattern is not entirely planned, is probably organic and certainly evades any sort of time-table. When the property owner decided to legally evict the artists and replace the 111 First Street structure with luxury housing and an upper-class shopping district, several of gentrification’s Stations of the Cross were skipped.The (2005) demolition shortened that neighborhood’s road to Calvary: going from condemn to die straight to being placed in the tomb. Goodwin’s study examines the impact of artificially changing the urban renewal cycle. The fallow 111 First Street lot is not just a tombstone-like reminder that artist workspaces are gone, but the elimination of the subsequent progressions, such as bodegas, restaurants and affordable rents. Things are not utterly dire in the Power House District portion of downtown Jersey City. The Warehouse cafe is a superb coffee shop – but let’s not kid ourselves; between Downtown and the Waterfront – there is more barrenness (albeit with very groovy cobble stone streets and embedded railroad tracks) than things to do. There’s next to nothing and this nothingness is next to wealth-created desolation. When was the last time you hung out in the boutiques at the Trump? I was in 111 First Street once. It was probably after 9-11. A sunny day, late Spring if I recall right – the first of the year’s T-shirt weather days. There was a bulletin board outside this cool old factory building. It was before the blog days so I had no camera and didn’t come home and write up something fun or insightful (sometimes both!) A car parked nearby and a friend I knew from the gym – a tattoo artist – emerged with some friends. She lived there. She saw I was interested so gave me a brief tour. There was a huge kiln – I’m not sure what else to call it – in the center of the building. You could see all the floors from the inside. The floors were like levels wrapping around a hive. The hallways had three walls, the third wall being an open-air view of the kiln and of course, the other followers. The collective vibe of the design was undeniable and yet, the original purpose – a cigarette factory – was visibly intact. Her studio was a wide open space, a kitchen area and bedroom flowing into a work space where she did tattoos – quasi legal at the time – and adjacent to other area where that was an easel and canvases and such – illustrations and art for her non-skin work. 111 First Street was memorable and special. I can still recall its wonderful vibe. The video entitled “Drunk Cops in Jersey City”went viral in 2008 and Goodwin claims it can still be found on YouTube. Tenants organized an attempt to purchase the building, which of course was in vain. The Thesis raises questions about the lack of neutrality of the government, the power of developers, the limited rights of citizens and the short-sightedness of urban planning in Jersey City. The discussion that followed, which grew out of a Question & Answer session was equally lively. Many in the audience remembered the building, the controversy and there were even some former 111 First Street tenants on hand. Goodwin said his intent is to provide an historical document of this unique building. Nostalgia strongly lingers for 111 First Street in Jersey City. Goodwin’s paper, and his Tachair talk, did more than wallow in fuzzy memories about a bohemian hey-day. In our post-industrial age, populations are returning to, and re-imagining urban districts. Displacing populations and catering only to the wealthy so developers can make bigger profits undermines any gains made by urban renewal. If the quality of life city living offers is not available to all economic classes, the city that results becomes the opposite to the one you tried to save. “Enter the Artists: The Early Years of 111 First Street,” may be as much a stunningly sober cautionary tale as well-researched – and entertaining – historical study.